← WIP Wednesday: Too many things on the needles! My first pair of socks was a pair of top-down, traditional heel-flap socks. They fit my too-long, too-narrow, too-high-arched feet perfectly and hooked me on sock knitting. Then I discovered toe-up sock knitting, and was torn. So I played with a few variations. 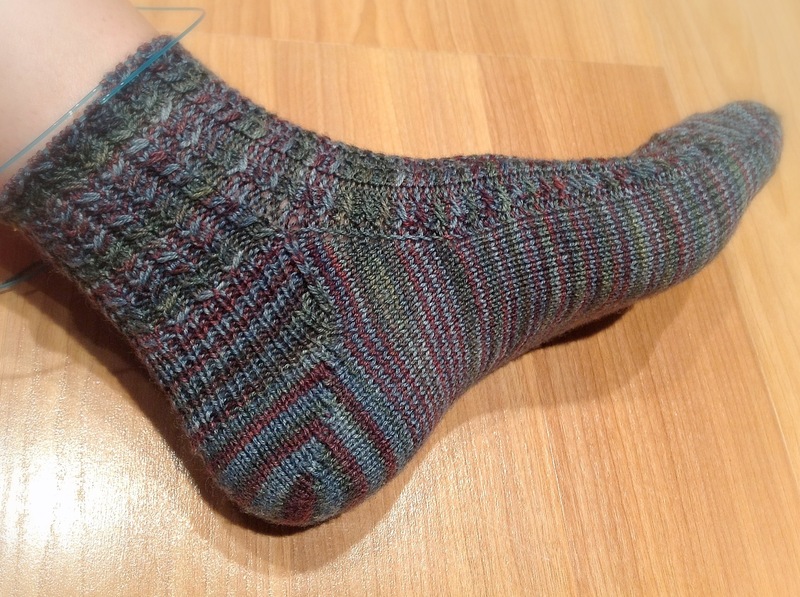 My Serpentine socks used a gusset heel that fit my instep well, but were a bit too big around my ankle. The short row heels in my Everyone Outta the Pool socks fit well but still weren’t that pretty, and they were a bit harder to keep track of/adapt to other patterns. The German short row heel I used in the first Solemate sock was easy to execute and looked okay, but was a little bit lumpy inside and required a plain round in the middle of the heel that messes up self-striping yarn patterns (and would also make it difficult to add a contrast-color heel). But once again, Ravelry came to my rescue. Another Raveler mentioned being pleased with a “shadow wrap heel” in one of the Rav forums the other day. Of course, I had to look that up immediately. And then I had to try it out on the second Solemate sock, which had patiently been waiting for me to get around to turning the heel. To accommodate my high instep, I combined the shadow wrap technique with a gusset: First I increased 1/3 of the heel stitches on either side, then I worked the shadow wrap short row heel (over the original number of stitches only), and finally I worked a 1×1 rib heel flap, consuming the gusset stitches until I was back to my original heel count (well, in this case, until I was down to my new heel count, as I needed a few extra stitches to continue my cable pattern seamlessly around the sock). Success! The heel fits beautifully and comfortably over my arch, and the ribbing (which I worked on needles one size smaller) hugs the back of my heel and adds a little bit of padding like a top-down heel flap does. The short rows are easy to execute and keep track of, and the finished seam is pretty and gap-free. I think I’ve found my go-to short row heel! What’s your favorite sock knitting method? Top-down? Toe-up? Heel flap or short-row? Wrap-and-turn or something else? Gusset or not? Have some other fabulous technique I haven’t heard of yet? Please let me know in the comments! Posted on September 5, 2012, in design, knitting, projects, techniques and tagged knitting, short rows, socks, Solemate Socks, toe-up. Bookmark the permalink. 1 Comment. That is a beautiful sock! And I am impressed that you could look beyond the pattern and customize a heel that worked for you. I would like to try a short row heel for some toddler socks. Is it possible to simply substitute a short row heel for a flap and gusset in a pattern? And just not make the decreases? Thanks so much for any advice!